Hong Kong, Macau, 11 October 2013) Renowned as the “Oscars of Watchmaking”, the annual Grand Prix d’Horlogerie de Genève (GPHG), or Geneva Watchmaking Grand Prix, is the highest honour of the watchmaking trade to reward the world’s best timepieces and watchmakers. Every year, entries are accepted from all watch brands to participate in the Grand Prix’s ten categories, as well as the most prestigious distinction “Aiguille d’Or”, awarded to the best overall watch among all categories. Grande Complication Watch: Watches featuring three combined major complications (perpetual calendar, equation of time, minute repeater, tourbillon, split-second chronograph etc.) or at least two major complications along with several minor complications (power reserve, moon phases, dual-time function, simple chronograph, etc.). Ladies’ Watch: Ladies’ watches with no complications (basic indications: hours, minutes, seconds and possibly the date). Ladies’ Complications Watch: Ladies’ watches featuring one or several complications. Men’s Watch: Men’s watches with no complications (basic indications: hours, minutes, seconds and possibly the date). Men’s Complications Watch: Men’s watches with one or several complications. Innovation Watch: Watches comprising a technical innovation and/or an innovative design. Jewellery Watch: Watches demonstrating exceptional mastery of the art of jewellery making and gemsetting. Artistic Crafts Watch: Watches demonstrating exceptional mastery of one or several artistic techniques, such as: enamelling, lacquering, engraving, guilloché (engine-turning), openworking (skeleton-working), etc. Sports Watch: Watches designed for sports activities, water-resistant to at least 100 metres and shock-resistant (ISO standard 1413). “Petite Aiguille” Watch: Watches with a retail price of under CHF 7,500. This year two new prizes will be presented: the “Horological Revelation” prize for exceptional achievement by a young brand, and the “Revival” prize for best contemporary reinterpretation of an iconic model. Watch enthusiasts are also invited to help choose the winner of the Public Prize by voting for their favourite on the award event’s website [www.gphg.org], or via GPHG’s mobile application. Those who vote will be entered in a prize draw to win a luxury timepiece. Every year, the pre-selected timepieces of the GPHG will travel the globe in a world tour before the awards ceremony is held in Geneva. Following the exhibitions in Shanghai and Hong Kong in 2011 and 2012, the tour will make its debut in Macau this year at Galaxy Macau’s East Square from 15 to 18 October 2013. The exhibition will feature 69 pre-selected timepieces from the ten categories of the Grand Prix and is a not-to-be-missed event for collectors, connoisseurs and aficionados of fine watchmaking. Representatives from GPHG, Edmond de Rothschild and Edipresse Group gathered at Galaxy Macau for its unveiling (Hong Kong, Macau, 15 October 2013) – This evening, hundreds of VIP guests, celebrities and members of the media gathered in Galaxy Macau™’s 2,100-square-meter East Square for an opening cocktail celebration of the annual Grand Prix d’Horlogerie de Genève (GPHG), or Geneva Watchmaking Grand Prix, the premier event on the international watchmaking calendar. Every year entries are accepted from all watch brands to compete in ten award categories with the finest timepieces in each category selected to travel the world prior to an annual year-end awards ceremony in Geneva where, in a stunning final award ceremony dubbed the “Oscars of Watchmaking”, the most exceptional timepiece will be awarded the highly-coveted Aguille d’Or or Golden Watch Hands award. This year, the tour made its debut in Macau, a destination recognised for its great interest in watchmaking. Mr. Barrie C. Goodridge, Chief Executive Officer of Edipresse Asia, publisher of Hong Kong Tatler and Revolution, the official event organizer and supporting media respectively, along with Mr. Carlo Lamprecht, President of the Grand Prix d’Horlogerie de Genève and Mr. Gabe Hunterton, Deputy Chief Operating Officer of Galaxy Macau, the exclusive sponsor of the Exhibition, kicked off the event with welcoming speeches. Following this, attending celebrity guest Ms. Karena Ng took the stage to share with event guests her passion for luxury timepieces and fine watchmaking. Officiating guests Mr. Goodrdge, Mr Lamrecht and Mr Hunterton then rejoined Ms. Ng onstage, along with Ms. Carine Maillard, Director of the Foundation of the Grand Prix d’Horlogerie de Genève, Ms. Janette Kendall, Senior Vice President – Marketing of Galaxy Macau, Mrs. Valérie Boscat, Head of Communication and Marketing of Banque Privée Edmond de Rothschild, the Global Partner of GPHG, and Ms. Zita Ong, Managing Director of Edipresse Hong Kong & Macau, for an unveiling ceremony and champagne toast to the success of GPHG’s first exhibition in Macau. Mr. Lamprecht then hosted a tour of the 69 horological masterpieces on display, introducing guests to the unique, creative innovations of each selected timepiece. Ms. Janette Kendall, Senior Vice President of Marketing of Galaxy Macau, said, “Galaxy Macau, The New Palace of Asia, continually strives to bring new, prestigious and memorable experiences to our resort guests. We are honoured and excited to host this exhibition of one-of-a-kind timepieces that represent the finest in watchmaking traditions and craftsmanship combined with technical innovation, design and novelty. The precision and attention to detail required to produce these masterpieces mirrors our own “World Class Asian Heart” philosophy of attentiveness and commitment to excellence. Values also shared by our esteemed partner in this event Hong Kong Tatler, a leading authority on the luxury industry in Asia. Mr. Carlo Lamprecht, President of GPHG, remarked, “GPHG is honoured to collaborate with the Edmond de Rothschild and the Edipresse Group once again, and to join our new partner Galaxy Macau in bringing this important event to Macau”. Galaxy Macau, the resort regarded as The New Palace of Asia and renowned for its “World Class, Asian Heart” hospitality, was identified as the perfect partner for this prestigious exhibition based on its luxurious surroundings and previous successful associations with some of the world’s most highly regarded brands. The exhibition featuring 69 exquisite timepieces worth around HK$49 million will be on display at Galaxy Macau’s East Square, Macau’s premier venue for special events and exhibitions, from 15 to 18 October. 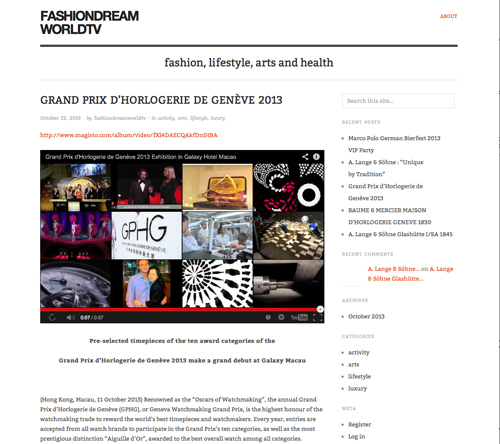 It will then travel on to Dubai, Geneva and Singapore before returning to Geneva for the final award ceremony on 15 November 2013.